With the help of a special type of cryptocurrency called NFT, it is possible to create unique tokens. Now, the Swedish company Marblecards has been launched, a service that transforms internet links into unique virtual collectible cards. One of many ways to use the blockchain technology is through so-called NFTs, i.e. “non-fungible tokens”. It is a special type of cryptocurrency that represents something unique – unlike, for example, bitcoin which is a “fungible token”, which is something that can easily be replaced by a similar unit. A practical application for this type of tokens is collectible card games such as Cryptokitties, a blockchain game where you can buy, take care of and sell different types of virtual cats. Now, a similar virtual collectible card game has been launched by a Swedish company – Marblecards. This time, however, the service is not about virtual cats, but rather transforming internet links into virtual collectible cards. “Every unique internet link, i.e. URL, can be ‘marbled’ to a collectible card. 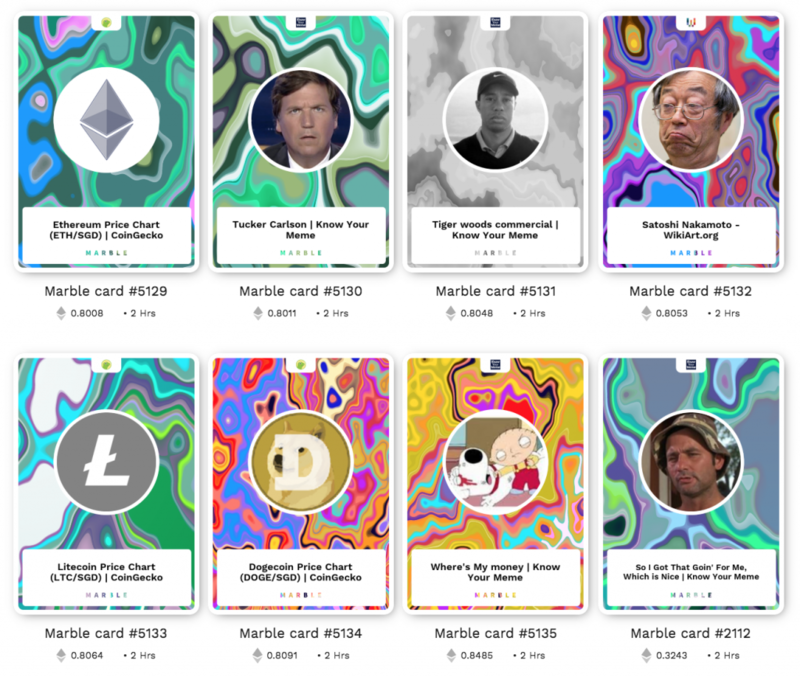 When a link has been ‘marbled’, for example, Elon Musk’s Twitter account, it cannot be ‘marbled’ again, so then there is only one card on that link”, says Johan Unger who has founded Marblecards together with his business partner Mattias Tyrberg. Marblecards was launched in January and is based on an NFT called ERC-721 on the ethereum network. This allows people to exchange their collectible cards, i.e. their tokens, with each other and also to buy and sell them on other platforms, Johan Unger explains. “It’s just like any cryptocurrency. You can have them in your ethereum wallet. If you have a third-party wallet that supports NFT, you will see the picture there too, says Johan Unger to Trijo News. It costs one dollar to create a collectible card at Marblecards. When the card is created, it is then sold at a higher price at a public auction on the site where anyone has the opportunity to buy it. During the auction, the price slowly drops towards one dollar again. If someone buys the card during the auction, the person who created it receives 30 percent of the purchase price, while Marblecards takes 70 percent. If no one buys the card during the auction, it goes to the user who created it. Now, in the beginning, it is only possible to create links from certain selected sites, but the goal is to be able to choose from all the links available on the entire internet. In the future, the plan is to also be able to combine different cards to create new and better virtual collectibles. “It is very human behavior to collect things. Marblecards is a platform where you can collect what you think is important and care about. I think the combination of having a token linked to a link means that you can get very interesting data on what people value and care about”, says Johan Unger. Many of the collectible cards on Marblecards contain images that seem to have copyright, for example from the photographer or from the company behind the logo. According to Sanna Wolk, associate professor in copyright at Uppsala University in Sweden, it is allowed to download images from the metadata that are located in links. However, the original image must be legally stored on the server from which the image is downloaded. “If the image was illegally uploaded on the first site to which you link, then you will be held accountable for copyright infringement”, says Sanna Wolk to Trijo News. But according to Johan Unger, Marblecards does the same as Facebook and Twitter when they download images from sharing links. “The user must not upload incorrect material. If they do, there are ways for those who own the rights to contact us. Our goal is to generate traffic to the links and if you do not want the material to be shared, then the site can choose not to have images in the metadata for sharing, then no card can be created either, says Johan Unger.